He is describing the inevitable consequence. There are many ways I could introduce you to my fantasy novel Graynelore. I could explain the birth of the idea that brought me to write it. I could describe the nature of its twisting fey storyline. But I would prefer to begin with the man who narrates the tale. A man who not only lends his very distinctive voice to the story but who is also the sole source of our knowledge concerning the world of Graynelore… Without him there would be nothing to tell. In short, Rogrig Wishard is a typical man of Graynelore. Once you’ve met one, believe me, you’ve met them all! The world he grew up in is lawless, and dominated by its graynes, its feuding families. It’s a world where everyone who isn’t family is an enemy. A world where, theft, blackmail, kidnap, murder and pillage are all considered an acceptable part of daily life. And do you know what? Rogrig Wishard likes it that way. He’s used to settling arguments with his sword. Everything is so clear cut that way! When his Graynelord tells him to fight, he fights. It’s a world he understands. His father was murdered in a blood feud when he was a child. He is used to cold-blooded killing and he’s used to death. His grayne is his family. Man or woman, they’re his friends, his work mates, his right hand in a fight, his drinking partners and his bed-fellows. Indeed, to put it none too politely, they all piss in the same pot. Just don’t talk to him about love, and leave faerie tales to the children! Mind you, if Rogrig Wishard was only the callous, stone hearted reiver described here, there would be very little story to tell. Fortunately, he’s a more complex character than initially meets the eye. There’s another side to this man. If it’s a side he’d rather not have, and certainly would never discuss. You see, Rogrig Wishard is faerie-touched. He has ties to a forgotten fey kin that can only be found outside of his grayne. And there are fundamental parts of his true nature that can only be fully revealed by him turning his back on his old family, and finding a new cause to fight for; one he could never have foreseen; one that includes faeries! So, he’s a fighter then, and an opportunist; a stubborn thief and a mischievous liar… A man, more than a man, very much at odds with himself! Might the revelations, the insights, the unlooked for personal journey he’s forced to take, finally melt the heart of the reiver who would prefer to call himself, Rogrig Stone Heart? Well, I guess that’s to be seen. Graynelore is a truly twisting epic fantasy. I’m excited and extremely pleased to announce that today is publication day for my fantasy novel GRAYNELORE (Publisher: HarperVoyager). I’ve been a children’s author for many years. Finally, here is my debut novel for all you grown-ups! GRAYNELORE is a brutal, lawless world, where a man’s only loyalty is to his grayne (his family). Murder, blackmail, theft and blood-feud are all part of daily life. Faerie tales are myths, strictly for the children. Why then is Rogrig Wishard – a hardened fighting-man who solves his problems with his sword – suddenly hearing voices and seeing faeries for real? What makes him embark upon a seemingly ridiculous quest to restore a Faerie Isle to the world? Is he mad or simply faerie-touched? If he’s going to make any sense of it he’s going to have to go right to the source – the faeries themselves. But that’s easier said than done when the only information he has to go on is from bards and myth. How might I best describe GRAYNELORE? GRAYNELORE, published by HarperVoyager (paperback and ebook). This week marks HarperVoyager’s (my publisher’s) official reveal of the cover for GRAYNELORE my new fantasy novel for adults. What better way to celebrate than to tell you something more about the cover’s creation. For if every book has its story, then surely, so too does every book cover. GRAYNELORE is a brutal, lawless world, where a man’s only loyalty is to his grayne (his family). Murder, theft, blackmail and blood-feud are all part of daily life. Faerie tales are myths, strictly for the children! So why then is Rogrig Wishard – a hardened fighting man who prefers to sort out his problems with his sword – suddenly hearing fey voices and seeing faeries for real? GRAYNELORE is a strange world indeed. And how best to capture that on a book cover…? If my books are akin to my children, then their covers are akin to the faces of my children, can there ever be a perfect image? This cover for GRAYNELORE was designed by the talented Cherie Chapman, part of the design team at Harper Collins, and she’s done a great job! Let me describe it to you. We can see an armed man, Rogrig Wishard, creeping tentatively through a very murky and jaundiced-looking woodland glade. And he is moving in company with a strange band of crows. The designer has deliberately scratched and defaced the overall image emphasising the gritty, truly eerie fey-like nature of the scene portrayed. It’s a wonderfully moody and brooding other-worldly image. Perfect for a grown-up faerie tale! Whatever the designer’s exact intentions, I see it as representing a particular moment in the book; one where Rogrig and his company are travelling through a forest called, The Withering. In The Withering danger lurks at every turn. The men of Graynelore are up in arms and attack is not only likely but imminent – and from any quarter. More so, as neither Rogrig nor his companions are quite what they seem to be. You see, they are fey… faerie-touched in a world where their discovery would bring about certain death. Why, when it comes to the written word, is property not property? Accuse me of thinking too far ahead, but, how can it be fair, that in the 21st Century landed gentry can still earn income from land inherited from a distant 13th Century ancestor and yet, the descendents of an author looses the right to any income from that author’s work only 70 years after the author’s death? Why should the descendents of say, Charles Dickens or Robert Louis Stephenson, to name but two, not benefit from the work of their ancestors? (After all, the publisher still benefits; the booksellers too; and the tax man.) Because an author decides to plough the written word, rather than plough the fields of England should not be to their disadvantage. Now, the laws of all countries surely differ, and I can only speak as an English layman. But I still cry,unfair! No doubt someone will attempt to persuade me of my ignorance. Land is, after all, land…physical property. A book is just…a series of ideas that have been written down, thus…intellectual property. I say, if there is a difference between these examples, there is also an obvious similarity; they are both property. So, I cry again, unfair!. Oh, I’m forgetting, for us airy-fairy, pie-in-the-sky creative types our work is our vocation. (Isn’t it amazing how often that word, vocation, is used to excuse poor reward for ever so many jobs and professions…?) Writers are, surely, only interested in leaving an artistic legacy to their heirs…? I’ve just spent the best part of the last four weeks working on the edits of my fantasy novel, GRAYNELORE. There were some very long days, and there was often very little sleep. But all in all, the editing was much as I expected it to be – and just how I’ve described it in Part One of this blog! Yes, there were times when I had to think hard about the editorial comments made, but there was nothing I could not agreeably handle. This is where the editor queries the story of the book. Is everything there that needs to be there to tell the story in the best possible way? Is anything missing? Indeed, is anything not needed? Is anything underwritten or overwritten? Is the pacing correct? Is there anything in the manuscript that might not be understood by the reader? All good and important stuff…. This is the longest stage in the editing process (well, at least it is for me). As all editing queries are informed suggestions – not commands – it often takes me as long to come to the conclusion that a particular editorial comment is not valid as it does to revise the text when I agree with a query. This is where the copyeditor checks the manuscript for consistency and clarity in its written English. For example, are all the character/place names spelt the same throughout the manuscript (a simple, not uncommon, error)? Is the punctuation consistent? Is the writing style consistent? (In GRAYNELORE a narrator tells the story and he has his own very individual voice!) Does the use of English say what the author means it to say? This might all sound terribly dry and dull, but oddly enough, I enjoy this process, and my copyeditor was excellent; particularly at understanding the individual nuances of the narrator; and at uncovering the occasional accidental mistake made by the author. This is a final chance to check the manuscript for literal errors – typesetting mistakes and the like. You might well ask, after all the checking that has already gone on can there still be errors in the text? Well… yes. Nobody is perfect. Not the editors. Certainly not the author! It takes a skilled and careful eye to spot the last few typesetting mistakes that still lurk unnoticed among any manuscript. And if we’ve all come across the missing punctuation or misspelt word in the books we’ve read, rest assured; the author and the editors have done their level best to get it right. 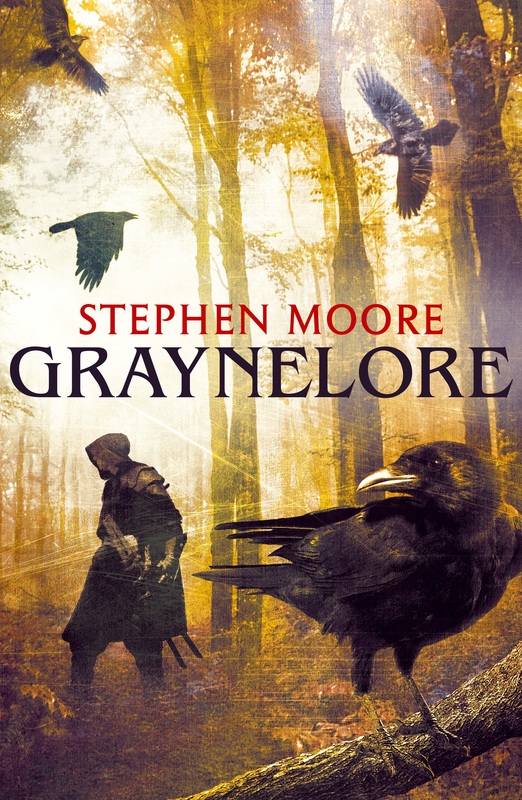 Stephen Moore’s GRAYNELORE. Published by HarperVoyager (paperback and ebook). I’m often asked: “But it’s your book! How can someone else simply come along and tell you to change it?” It’s a common misconception of the editorial process. In truth, that’s not how it goes. Could you, for example, ever imagine making a movie without a film editor? Let me try to explain how the editorial process actually works. I must begin by saying that every book I have ever written has benefited from the process. I would go further and say, there is not a book in the world that could not be improved by a good editor. No author is perfect. No book is perfect. An editor has exactly the same goal as the author. They simply want your book to be the best that it can be. They don’t want to re-write it, they don’t want to own it. When I write a book I’m creating a new universe: and I’m doing it all inside my head. When I come to write it down, I try my very best to get it right, to tell the story in the very best way I can. With nothing missed out and nothing superfluous to the tale. Now, when an editor reads my book, they have never been inside my head. They only have the written words to go on. Those fresh pair of eyes can spot where perhaps some essential piece of information has been accidently omitted, or perhaps where too much is given away too early in the plot. They can see where the text appears unclear in its explanation. Or where the text has been overwritten or underwritten making the pacing of the story unbalanced. Many, many small things, that if put right will make the book all that much better. And, of course, an editor can also see all the things that are absolutely right! And they will often tell the author so, which my sorely wounded ego gratefully welcomes. Doesn’t the author have any say in this process? Well, yes, naturally. Author and editor are on the same team! And if no author is perfect, then neither is any editor… and they don’t pretend to be. (Not the good ones). Editorial comments are informed suggestions, not commands! An author is entitled to disagree. There may well be a little anguish (usually on the part of the author). There will certainly be discussion. And there will be resolution. Though never compromise… where the proverbial race horse becomes, inevitably, the proverbial donkey. Indeed, the editorial process works in favour of the author. And to give one famous example, using perhaps my favourite book of all time, it is why Robert Louis Stephenson’s classic work is entitled, ‘Treasure Island’, and not, as he would have had it, ‘The Sea Cook’. 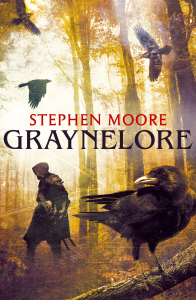 *Stephen Moore’s GRAYNELORE (published by HarperVoyager in paperback and ebook). My favourite book is my dictionary. It excites me. Each time I open it, the endless possibilities come tumbling out. It’s Alice falling into Wonderland. It’s an artist’s paint box. It’s a new day. It reminds me why I am a writer. Who are children’s books written for? There’s an obvious answer to this question, of course. But here’s another notion for you…Children’s books are written for all readers. Might I explain? When I first began to write, which was back in about 1994, I didn’t have a clue who I was writing for, if not myself. Anyway, it was always art for me… Until, one extraordinary day, I began to get ideas with words in them…! To be honest, at first, they puzzled me. What was this? Poetry…? Songs…? Nah! What then…? In the end, I found myself writing a story…that began to turn itself into a book. The book was called, “The Spellbinder”. When I knew I had the beginnings of a book, I sought out other authors, and it was only then that it became clear I was writing a children’s book. Eventually, “The Spellbinder” became my first published book, though it went through a name change and is better known as, “Spilling the Magic”. OK then…I didn’t begin by trying to write a book for children. I simply wrote…I still do. So, who are children’s books written for? For me, what marks a book out as a children’s book, is that it’s written in such a way that a young reader can understand and enjoy it. With content appropriate for the youngest readership you want to attract. But there is no upper age limit. The very best children’s books are fulfilling reads for everyone! Children’s books are written for allreaders. Stephen Moore signs a new book publishing deal! To begin with, it means I have a brand new book coming out very soon. My first in a long while. It’s also wonderful that my publisher is none other than, HarperVoyager, – the fantasy/sci-fi arm of HarperCollins, one of the world’s largest publishers – for which I thank them most sincerely. And if that isn’t excitement enough, my new book is extra special in another way. How so? Well… Grown-up followers of my children’s books have been nagging me for many, many years to write something especially for them. And guess what? Now I have! You see, my new work is my very first book for adults! Some of my favourite books are not the best books in the world. True! Some of my favourite books are not the best books in the world. Let me say, to begin with; there is no such thing as the perfect book… mine included… (and if that doesn’t cause an argument, a debate at least, nothing will!) But count your blessings, I say! Trying to say exactly what we want to say and trying to say it in the best possible way is exactly what authors strive to do. And that’s irrespective of why we are writing… to entertain, inform, educate or whatever. It would be a conceited author (nay, a fool) who ever thought their work was anywhere near perfect: and that author would be heading for a fall. Can there be a reader, who hasn’t gotten part way through a book only to find themselves annoyed at the author for leading them that far into their work, just to abandon them there… the book has lost its way, lost its interest, or become meaningless? Hmmm, I know I have. Sometimes I forgive the author and carry on; if I feel the work, so far, has meant something to me in some way. Quite often though, I don’t; particularly with authors, or indeed with publishers, I think should know better. Make better reading choices. All readers, from kids to grown-ups are maybe guilty here. Don’t take on something you’re not ready for… it might be the nature of the writing style, the complexity of story… even the length of the book. Don’t read something just on someone else’s, say so, or because the cover looks similar to something else you’ve already read, or because there’s a great big advertising campaign telling you that you must. And if you get part way through and just can’t go on… Then stop. Pick something else… there’s always something else. Does the length of a book really matter? There seems to be a growing debate regarding the length of books… Are longer books better? Are shorter books, somehow, short-changing readers? Speaking as an author my response to both questions is a straight forward, no! And that is regardless of the genre or the audience I am writing for. Let me explain. For me, it’s not a case of making a book a certain length – short or long – rather, it’s about making a book the length it needs to be to tell the story I want to tell. Be it short or long; does not matter. Either lengthening a book with unnecessary stuffing to make it artificially longer, or under-writing a book to make it artificially shorter are both unforgiveable crimes in my eyes. In the end, it is the quality of the story being told that counts not its length. I do feel for the reader who is so enamoured of a short book that they are sorely disappointed when it comes to its end, wishing that it could go on and on… However, all good things must come to an end! And as long as that end is in the right place for the story being told, I’m happy with that. Because I also feel for the reader who struggles through the pages of an over-written over-long novel, desperately wanting to know how the story turns out, but only wishing that it would hurry on up and get there. Once upon a time, when all books were printed, there were good practical reasons for artificially making certain types of book a certain length. For example, to physically make and bind a printed hardback book at a particular size meant an exact number of pages being needed to make the exercise economic. No printer or publisher can afford to print blank pages or to throw away excessive amounts of waste paper. Of course, today, with modern printing techniques and the benefit of the ebook revolution this is no longer a good argument. So, certainly, the length of a book matters… I could not agree more. Every book has to be the right length! And that is all part of the author’s craft. Where did the idea for “Tooth and Claw” come from? It has been exactly one year since I wrote my very first blog. To celebrate I’m revisiting that blog with new material that gives a little more insight into the birth of the idea that lead me to write my epic animal-fantasy, “Tooth and Claw”. I hope you enjoy it. The one question, above all others, I’m always being asked as a writer is… Where do you get your ideas? So, when talking about my most successful book to-date, ‘Tooth and Claw’ – originally published in 1998, and the first of my books re-released as an e-book – where the idea came from is a good place to start. Firstly, I’ve spent most of my working life in the creative arts; as a designer, and as an author. I’ve always played with ideas and I can often catch them completely out of thin air! (Lucky me!) However, sometimes the source of an idea can be pinned down… to an event, or a place, or an experience. And just as often, to this simple question… What if? The idea for, ‘Tooth and Claw’ is a, What if? Every night, year upon year, Jenny went through this performance. And every morning I was always there for her. And then, one night, as she left, I asked myself a question… What if? What if, tomorrow morning I was not there to let her in again? What if the house was empty; closed up and locked against her? What would she do then? What would become of her? You see, around the same time, I went on holiday with my family to Oludeniz, a small extremely beautiful beach resort, in the Fethiye district of South West Turkey. (It boasts its own blue lagoon.) While we were there we took it upon ourselves to walk to the nearby hill-top town of Kayakay. However, Kayakay was a most unusual place. It was, in fact, a true ghost town… Completely abandoned in 1922, after the Greco-Turkish War, its buildings were all still standing, largely intact. I remember the stonework of the empty buildings standing out starkly against the hillside. I remember its silence, its stillness… The monumental emptiness of it all was quite overwhelming… if strangely peaceful too. It was an experience I have never forgotten. Indeed, it helped set the stage for “Tooth and Claw”. No longer was it to be the story of just one cat locked out of one house. Instead, it became the story of all the cats and all the dogs across a whole city (if a very British post-industrial city). All of them; abandoned on a single night, when the human population is suddenly evacuated, and forced to leave their pets behind. Hi folks. This is where my blog on my website begins… When I blog it’s exclusively about writing! Mine and the world of writing in general, with the odd book review thrown in along the way… As I’m a fantasy author, I’ll talk about my own writing experience, what I’m currently up to, and I’ll debate any current writing issues I think relevant. For a long time now I’ve been blogging from my Goodreads platform, so this is a change for me. It’s my intention to deliver my blog from both platforms for now. As well as new material, I may also update and re-publish some of my existing Goodreads back-catalogue if I feel there is value in it for readers on my website. To give you something to be going on with, here’s a link to my current Goodreads blog for you to check out. And thank you so much for taking the time to look this way. Please feel free to leave a comment!